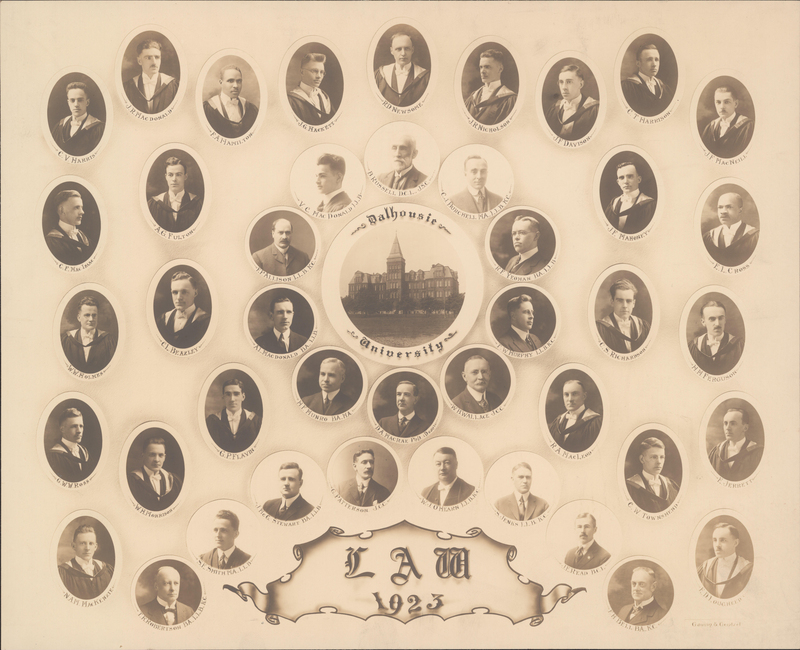 Item is a composite photograph of the Dalhousie Faculty of Law class of 1923. 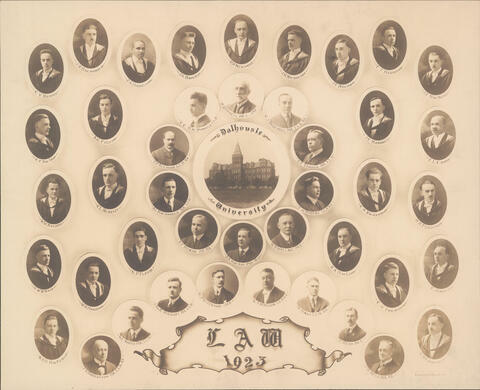 The photograph consists of portraits of C. V. Harris; J. R. MacDonald; F. A. Hamilton; J. G. Hackett; R. D. Newsome; J. R. Nicholson; J. F. Davison; C. T. Harrison; J. F. MacNeill; C. F. MacIssac; A. G. Fulton; W. W. Holmes; C. L. Beazley; A. L. MacDonald; G. W. W. Ross; W. H. Morrison; G. P. Flavin; N. A. M. MacKenzie; T. R. Robertson; S. E. Smith; J. McG. Stewart; G. Patterson; W. J. O'Hearn; S. Jenks; J. E. Read; F. H. Bell; E. D. Lougheed; C. W. Townshend; E. Jerrett; R. A. MacLeod; H. M. Ferguson; C. S. Richardson; E. L. Cross; J. F. Mahoney; H. F. Munro; D. A. MacRae (Dean); W. B. Wallace; T. W. Murphy; R. E. Yeoman; C. J. Burchell; B. Russell; V. C. MacDonald; and E. P. Allison arranged around a photograph of the Forrest Building.